This entry was tagged Andalucía, culture, customs, Europe, fiestas, life, Malaga, photography, Religion, Spain, travel, Weekly Photo challenge, Wordless Wednesday. Bookmark the permalink. The processions you have been sharing with us show how powerful faith is…very moving. 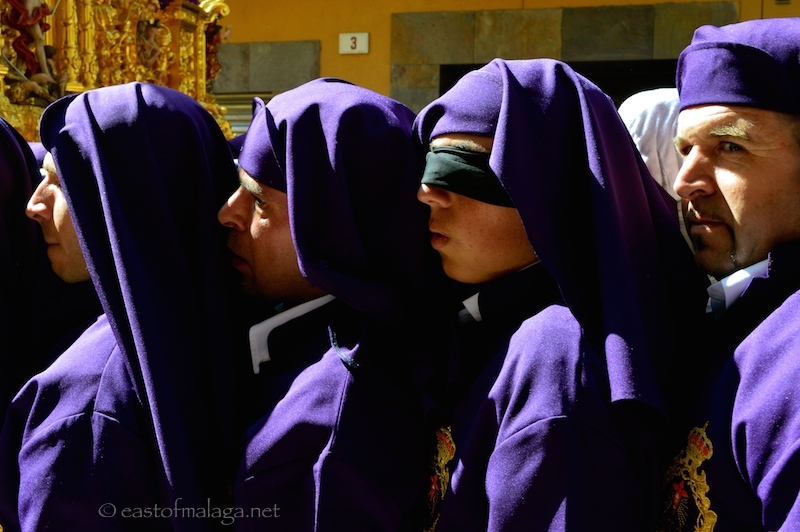 There is no need to be religious to be very moved even watching the Semana Santa processions. I am with the rest Marianne. This is one powerful image. Thanks Jo – means a lot for you to say that. it must be amazing to watch this parade! This was only one of 3 going on at the same time, Christine – with a further 3 scheduled for later in the day. I think I saw somewhere that there are a million people in Malaga for the Semana Santa processions! oh my … I am not much good in crowds … glad it was you Marianne! I managed to stay out of the crush, Christine – around the fringes, yet still catching the action. I’m not comfortable in huge crowds either. What a great photo, Marianne! Is this a case of having faith that you won’t stumble or does it have a deeper meaning with penitents? Apart from having blind faith that you won’t stumble …. as I understand it, this penitent is making an extra sacrifice as a special petition to God for the realization of a selfless wish or prayer. I took over 200 photos yesterday, but the series containing this young man were my favourites. He really hooked and reeled me in. I wanted to know more. I guess that’s why it’s such a powerful image. A very powerful image Marianne! Thanks, Gilly – I think so, too.